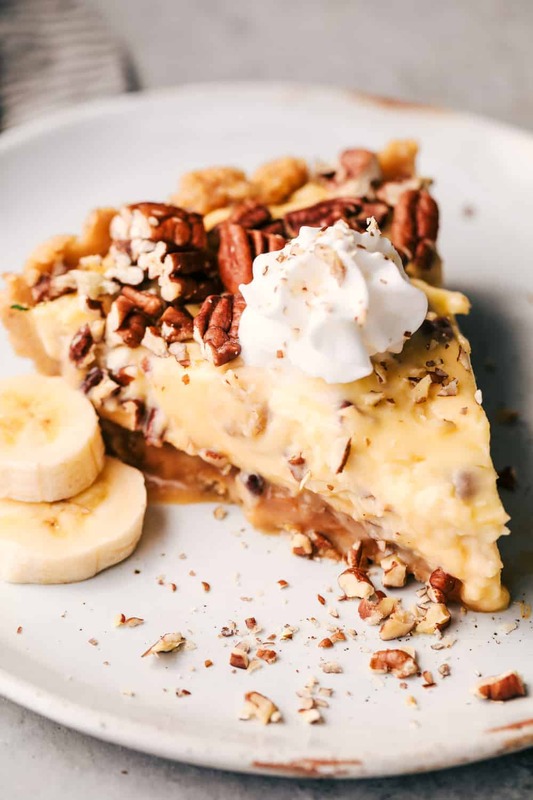 No Bake Banana Caramel Pecan Pie is made with a shortbread crust topped with caramel and a creamy banana filling with crunchy pecans. This makes one incredible no bake pie! It is summer time and it is HOT here in Utah. The last thing that I want to do is turn the oven on. That is why I absolutely love no bake pies in the summertime! 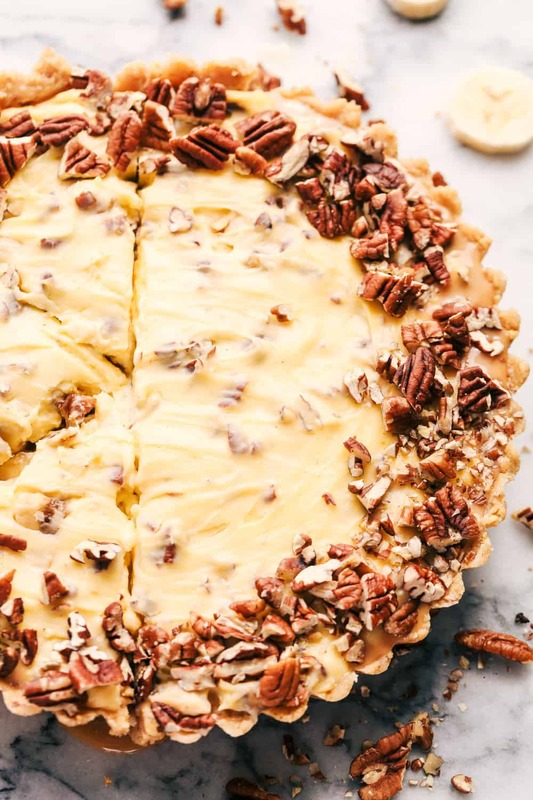 A cool and creamy pie at a potluck is one of my favorite things to bring! This is my first year working with Fisher Nuts. It was a no-brainer for me because I choose them every single time in the grocery store! 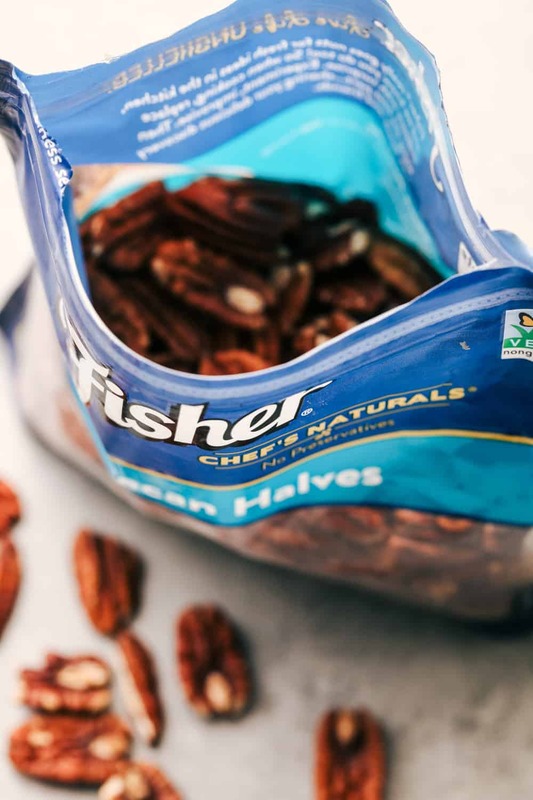 Fisher nuts are fresh out of their shells, have no preservatives and are non-GMO Project Verified. I absolutely love the stand-up bag and that it is resealable so that the nuts can stay fresh longer. I can simply grab them out of the pantry every time that I need to use them. This no-bake pie is incredible. It starts with a shortbread crust. Then it gets layered with caramel. 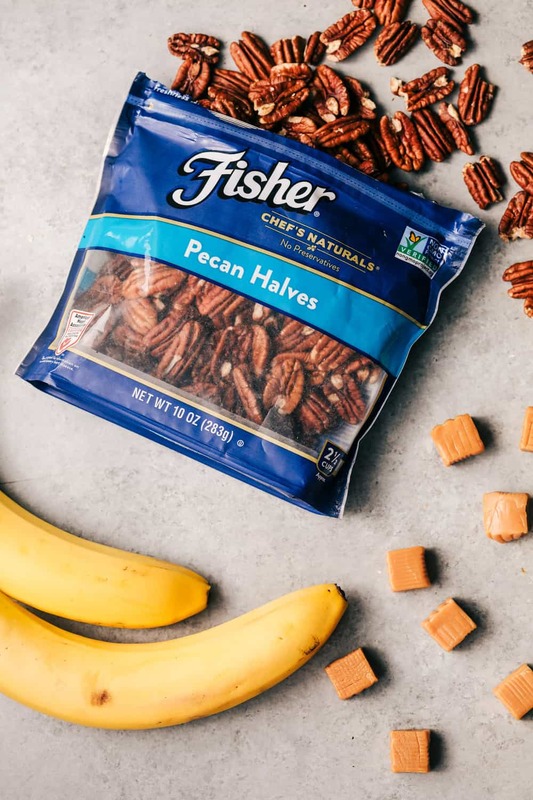 The banana filling has fresh chopped bananas and crunchy chopped pecans. I like to garnish it with chopped pecans on top to make a beautiful presentation. It is the perfect cool and creamy summer no bake pie and it is going to be the talk of the potluck! 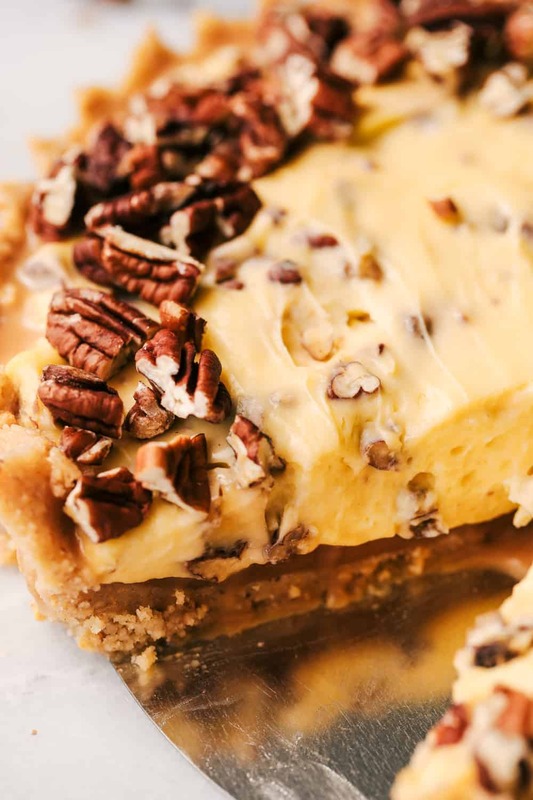 How do I make No Bake Banana Caramel Pecan Pie? Layer the shortbread crust with caramel and chill. Top with a creamy banana pecan filling. Garnish with crunchy pecans if desired. How do I make a no-bake shortbread pie crust? Start by adding shortbread cookies and pecans to a food processor and pulse until fine crumbs. Add in sugar and melted butter and mix until incorporated. Press down into a greased pie dish. You guys are going to love every single layer in this pie. The nutty shortbread crust followed by the caramel layer. Then the cool and creamy banana layer that is filled with fresh bananas and crunchy pecans. I was in pecan lover heaven!! This is the perfect thing to take to your next potluck or summer gathering! In a food processor, add shortbread cookies and pecans. Pulse until fine crumbs. Add the sugar and butter and mix until incorporated. Press firmly into a greased pie dish. Refrigerate while you make the next layer. Melt the caramel and heavy cream in a microwave safe bowl stirring after every 30 seconds until smooth and melted. Pour over shortbread crust and refrigerate to set. To make the banana pecan layer: In a large bowl, beat the milk and the pudding together until it starts to thicken. In another medium bowl, add the cream cheese and condensed milk and beat until smooth. Fold into the banana pudding. Fold the bananas and chopped pecans into the mixture until incorporated and spread evenly on top of the caramel layer. Chill the pie for at least 3 hours or until set. Garnish with chopped pecans and bananas if desired. Love your recipes, especially the slow cooker, I have now taken it out of its box [ at long last } to try some of your ideas. 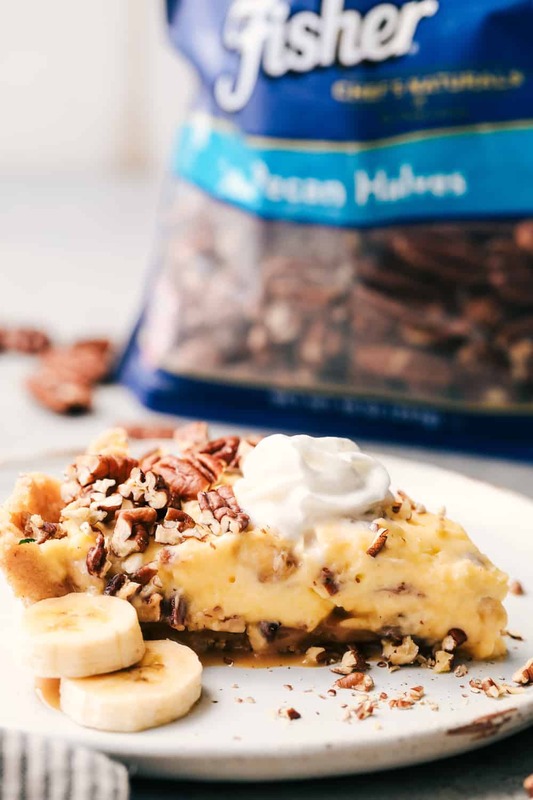 The Caramel banana Pecan no bake pie also sounds amazing. Love the slow cooker recipes, so helpful. I do love a shortbread crust. All buttery and flakey. The summer heat is upon us so these types of recipes are looking so good right now. I GOING 2 MAKE UR BANANA/PECANS PIE?? Made this for dinner with my mother-in-law and it was a hit! I had thought about taking the easy route with a pre-made graham cracker crust – but am so glad I did the shortbread crust – so yummy! I am wondering if this can be made the day before or will the bananas turn blackish. Very tasty but didn’t hold together at all. The caramel layer hardened and the banana pudding portion slid right off. Very difficult to slice. But again … it was delicious just not pretty.